Crooked Dice has some new Simian Minions available over in their webstore. 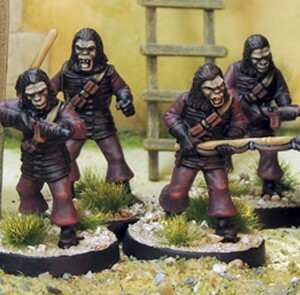 Crooked Dice have released four savage Simian Minions this month. Mark Evans has sculpted these horrific 28mm hybrids; two armed with rifles, one with baton and one wielding a sinister man-catcher. Each different pose come with a separate head. £11 for the 4 model deal or £3.25 each.